ROAD TOWN, Tortola, VI- Traffic along the west carriageway of the James Walter Francis Drive was interrupted briefly when an SUV slammed into a taxi bus that appeared to be turning into the left lane this afternoon, August 25, 2017. 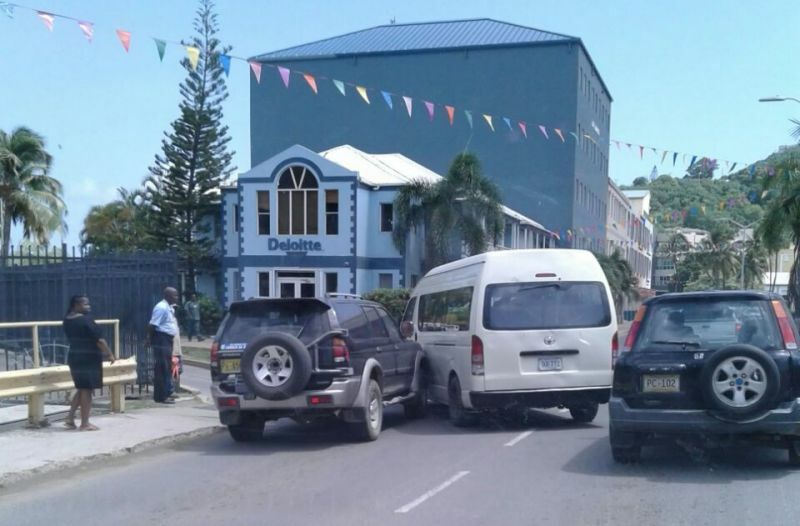 The accident took place in the area of Deloitte in front of the road that takes traffic left to the House of Assembly Offices and other government offices. this was caused by selfishness, carelessness, drivers arrogance or all three combined. No idiot. That was caused by the bus crossing the lane into the SUV. The bus was well across the lane. It was not a hard crash so it looks like the SUV was trying to prevent the bus from changing lanes. I see it all the time. Mr taxi man u always in some sort of vehicle accident you swear the road belongs to you the way u make sudden stops and change lanes. Be mindful of your moves man I sick and tired of you. And the headline makes it seem like the SUV is at fault. Dummy bus driver, use Your damn signal when you are changing lanes. You slam into my car because of your foolishness, I am going to own you. Right hand drives are the correct vehicles for driving on the left dummy! Does the U.K., Australia, Japan have it wrong and us in the bvi have it right?!? It's the stupidness of the government allowing so many left hand drive cars on the road! Both left hand drive dummy! Taxi bus dead wrong. What the hell they mean by saying the SUV slammed into the taxi? SUV had no choice. That taxi man needs to be taken off the road. The older the Taxi man, the more he feel the road belongs to he, just because he can remember what it look like before it was a road. Half them eldery taxi man need to go fish or cool out by a bar someplace, they should not be driving people around. This almost happened to me the other day with this taxi. I had to slam on brakes because he just came over with no signal and felt because he is the bigger vehicle, that he could just bully his way over giving me no warning. How many accidents has he caused so far? I say again give driver's licenses to law abiding citizens!